Performers include: Frank Sutton, Jim Nabors, Roy Stuart, Forrest Compton, Elizabeth MacRae, Buck Young, and Ronnie Schell. Bumbling and naive Gomer Pyle (Jim Nabors) leaves the quiet town of Mayberry, North Carolina, to join the U.S. Marine Corps. 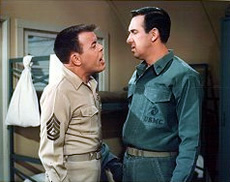 Stationed at Camp Henderson (near Los Angeles, California), Gomer is under the command of a hard-nosed Drill Instructor, Gunnery Sergeant Vince Carter (Frank Sutton). Gomer’s innocence and low-key demeanor often gets him into trouble with Carter but things always seem to work out to his advantage. Gomer’s sometime girlfriend is Lou Anne Poovie (Elizabeth MacRae), a singer at the Blue Bird Café where the military men relax. Other characters include Carter’s girlfriend, Bunny Wilson (Barbara Stuart) and military men like Gomer’s best friend, Gilbert “Duke” Slater (Ronnie Schell); Carter’s rival, Sergeant Hacker (Allan Melvin); Lieutenant Colonel Edward Gray (Forrest Compton); Corporal Charles Boyle (Roy Stuart); Private Lester Hummel (William Christopher), and Private Francis Lombardi (Ted Bessell). The series is a spin-off of The Andy Griffith Show. More about: Gomer Pyle U.S.M.C.